We’ve recently launched a new CD with all our favourite and much-loved close harmony songs. The CD’s title track, Listen to the Music, was one we fell in love with the first time we heard it. Arranged for a cappella singers by Liz Garnett, we have much fun performing it! The CD is a culmination of our hard work over the last five years developing our craft and improving our singing. We are very proud to also showcase Junior FR on this CD as well as our in-house octet RhythmMix. Copies will also be available at our performances. Keep an eye on our diary for more information. Four members of Fascinating Rhythm have put together a warm-up CD designed specifically to help you improve your range, warm up your voice and perfect various singing techniques. For just £10 including P&P, you can have fun and enjoy a wide selection of vocal warm-ups. Play the CD during the week to polish your vocal technique, then again on the way to chorus so you arrive at rehearsal with your voice already warmed up. Your MD will be delighted! To purchase a copy, please contact us. ‘Had a listen, it’s great! Very clear, clean and precise. Well done to you and the girls’. Jo Braham, MD of Cheshire Chord Company. Both CDs have been produced to raise funds for our chorus. © Fascinating Rhythm. Please respect copyright law. 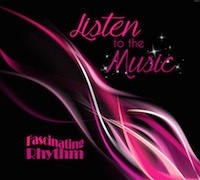 We now offer a range of goodies in Fascinating Rhythm colours! Pink pens £1.00, notebooks £3.00 and fabric bags £6.00. Or get the pen free if you buy both the notebook and the bag together! Contact us if you’d like to buy any of these items.